Some call them “Balcony Power Plants.” They represent the first generation of what may be the future of micro/small residential solar systems. They are off-the-shelf DIY solar systems that require little to no technical skills nor any permits for their installation. “It’s as simple as putting together IKEA furniture,” says Holger Laudeley, the engineer who developed this new kind of modular all-in-one solar system. The radical new concept is as simple as it is brilliant. 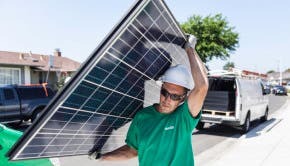 It consists of a rather regular-looking 195W solar panel that has all the necessary electrical equipment (inverters, wiring,…) mounted to its back. Up to 18 of these modules can be linked to form a 3.51kW solar system. The only thing the owner of new system has to do is: 1) point the panel toward the sun, and 2) plug it into a normal socket in the house or apartment. Laudeley’s new solar concept is marketed under the label “Sun Invention — Plug & Save,” and the best part of this story is: there are already two “Plug & Save” products available in solar PV online shops here in Germany (delivery time 5-7 days). “Plug & Save – Optimus” includes a 0.25kWh lithium-ion battery pack (+ battery management system), whereas “Plug & Save – Light” comes without a storage component. Additionally, there are several different mounting systems available for the DIY installation on flat roofs, on the ground, on walls, or as a balcony power plant. In one online shop, they offered a 0.975kW / 0.5kWh balcony-set (2xOptimus + 3xLight-modules) for €2,805 (excluding the German VAT: €2360). That’s $3–3.60/W for a system that even includes storage. In Germany, this system is expensive compared to multi-kW, roof-mounted systems, even small ones below 10kW. But it’s still a great offer with a lot of value for all those who don’t own a roof. Especially since this system could generate electricity below the residential electricity rate in Germany (roughly $0.32/kWh – including 50% taxes & fees). And, of course, there are many other reasons to install solar, that go far beyond a simple cash incentive. For example, the simple concept of self-reliance, taking marketshare away from energy corporations, and protecting the enviroment / future of human kind. Small things…. But since money rules the world, here’s a little “What If” graphic putting the generation costs of this system into an American context.